Welcome to our seed saving and sharing circles which have been running since 2010. Our group is based on the internet and made up from members of Allotments 4 All forum. I’d like to thank Real Seeds, as they focused the ideas for starting these groups. It really is amazing what a few people can achieve and share in a year and I’d encourage anyone to join our group, become a member of a similar group or set one up. We started out at the beginning of 2010, getting together a group of interested people, with a vague idea of what we all were going to be saving and off we went. As the season progressed it proved to be quite a learning curve, plus a fair bit of fun. There were a few hazards encountered during the growing season and a couple of casualties, but generally a good amount of seed was harvested and dried. Excitement grew towards the end of the year as everyone in the group was busy bagging up, labelling and then sending in their seeds. The seed packs were all collected together at one point and then divided into equal lots for each member, everyone receiving the same selection of seeds. 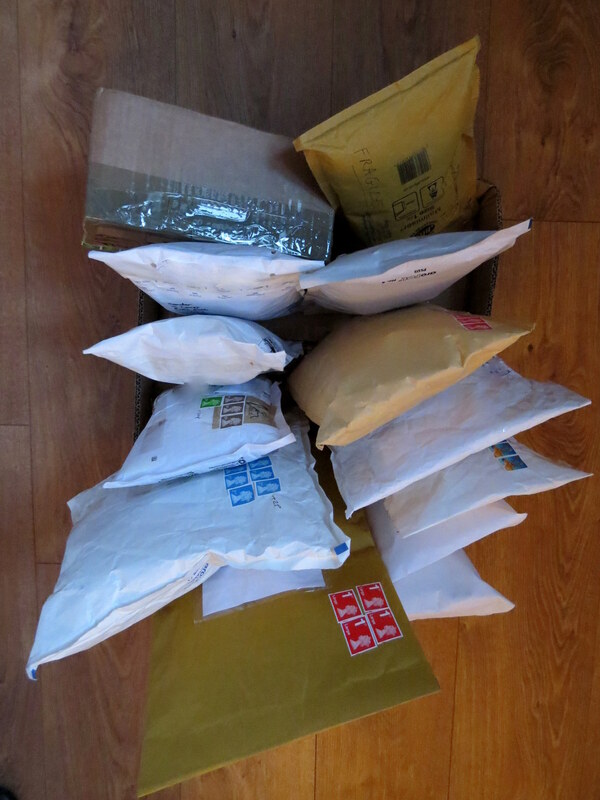 The individual seed parcels were then sent out to each member just before Christmas. 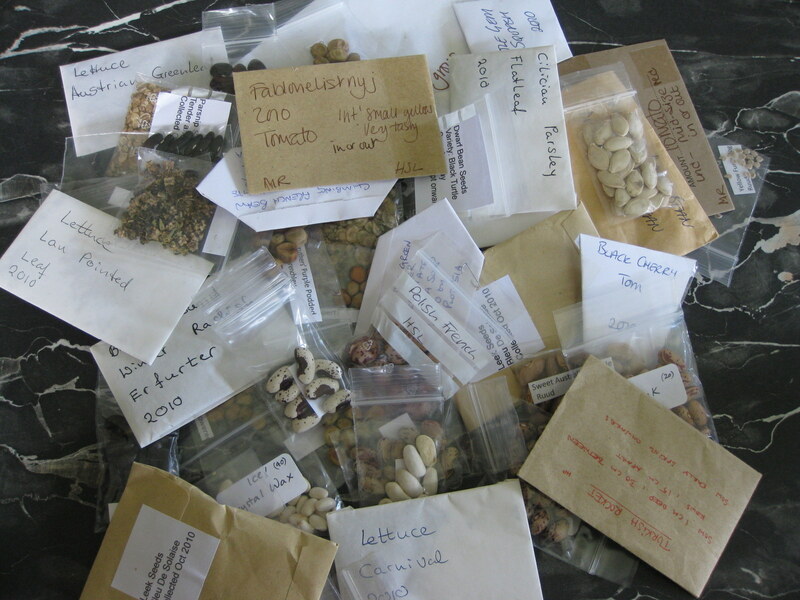 Our harvest for the Seed Savers Circle – a super assortment of fresh open pollinated seeds saved by each members. 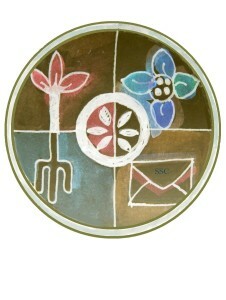 Having firmly got the seed sharing bug, the Seed Sharing Circle was decided on again for 2011. With it brought a new group of seed enthusiasts, some had taken part in 2010, but many were new to the group. As we had more members wanting to join it led to two groups, which kept the number of seeds needing to be saved in each group to a manageable size. Again the season had some notable ups and downs, but with our combined growing efforts great results were achieved. The parcels shared in mid December were exciting and varied. Our third year 2012, got off to a good start and then the great British weather stepped in…..rain, cold and yet more rain combined with gales followed by a little more rain! This all added up to make it just a bit trickier for growing and collecting seeds. But a hardy group of seed savers pulled it off and once again put together an excellent assortment for the Seed Savers Circle. 2013, another group and again we were lucky enough to attract some new members to the group, it’s always fun have different people join in and get the seed saving bug! Year 5 – 2014, wow this has been a good year (well for most things) It was lovely to have some sunny weather this summer and also a warm autumn helped with ripening and saving seeds. And what a lovely selection thanks to all taking part.